Temple is a broken man. Accused of a crime he didn't commit, he adopts the alter-ego of a brawler in order to own the image he didn't create for himself. Mara is a woman drowning in regret. She is unable to let her hidden truth out, but needs to find a way to pay her debts before she is pulled underneath for good. 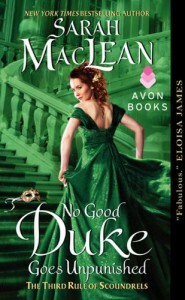 Even though No Good Duke was a pretty standard historical romance, there were still a few moments which managed to stand out. The story started with a violent event and progressed into a place that was not as fluffy as expected. And I kind of liked how it unfolded. Some of the normal witty HR banter was missing, but this story didn't necessarily need it, given the more serious tone. And it never hurts to have a hot scene thrown in which takes place in a boxing ring, right? If book 1 of The Rules of Scoundrels was the romantic sibling, and book 2 was the quirky younger sibling, this book would be the brooding cousin. I appreciated the progression in tone and how I was taken to a different place from the last couple's story. While book 2's brand of fun was more to my taste, I think No Good Duke is going to appeal to fans of broken heroes seeking redemption. There's something about watching a person pick up the pieces of their life that is satisfying to read. He froze. Absolution. How many times had the word whispered through his mind? This book provided from the publisher in exchange for an honest review. All quotes taken from the pre-published copy and may be altered or omitted from the final copy.